Texas District 32's boundaries spread over south Jefferson County and most of Orange County. The district plan is simple; clean, wholesome family fun. You are all invited to visit the league near you and enjoy the games. It is not only America's game, but our game right here in our hometowns. Come out and see tomorrow's stars today. It'll be something you can enjoy and remember forever. 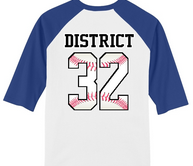 If you do not live in an area that offers Little League Baseball / Softball, please contact the D32 District Administrator (Jerry McInnis 409-882-2237 ) for help in finding a league. Little League has certain rules that governs the league you may play in. The DA will do everything possible to help find you a Little League home. Please do not go to a league that you are not affiliated with. This can only cause problems for you, your child and the league you join. If your community is not a member of the Little League family, and would like to be,call the DA to find how to organize a new league, and how to join LL Texas District 32.